Here’s an interesting concept for a game: you build a character for a fantasy role-playing game. You are given a race and class. You acquire traits, equipment and tweak and customize your stats to optimize your character. Even your character’s alignment between good and evil, lawful and chaotic matters. Then, your take your character on daring adventures…or not. You build and customize your character, and that’s the game (seriously). I’m being completely serious. 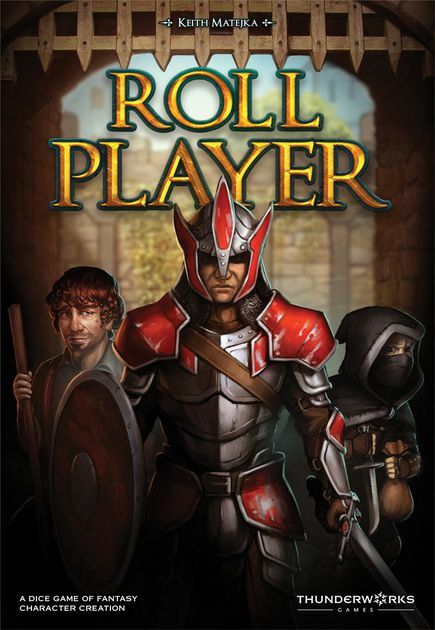 Roll Player is a medium-weight strategy game with all the fun of creating your character but without any of the burden of adventuring. 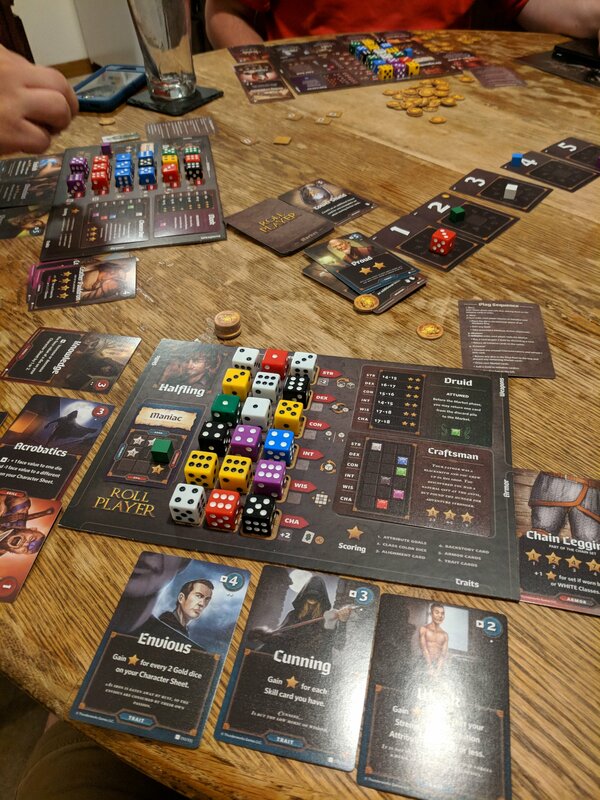 When we got about a third of the way into our first and only game so far of Roll Player, I was deeply concerned that I was going to lose interest. 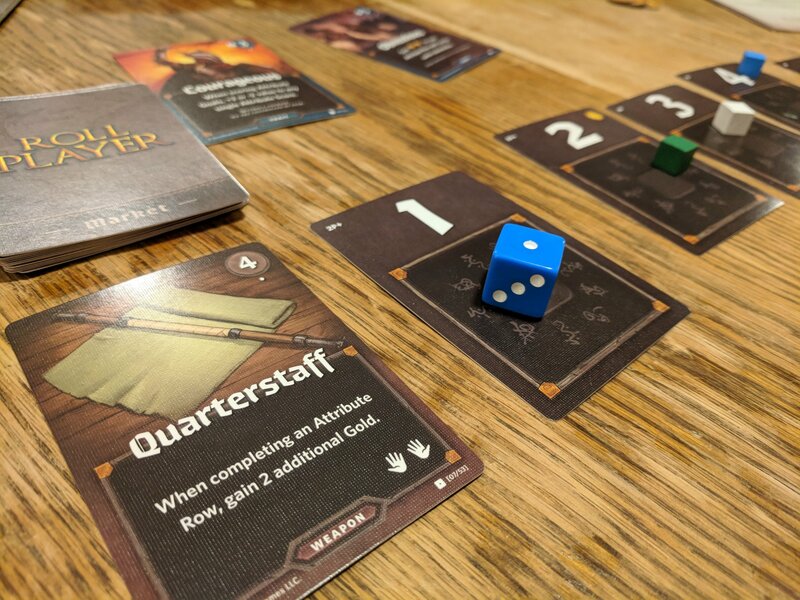 I had heard many good things about Roll Player, but didn’t realize that the games contains a strong puzzle nature, which is typically not my jam. However, the implications of what you’re doing in the game are thematic enough that it easily held my attention until the end. Players are given a race and class. The former affects your end-game scoring and the latter grants you an ability. There seems to be a good number or options for both so that will keep the game fresh for a decent number of plays, and more importantly for me, there is already at least one expansion that adds more variety of content. Players all roll some of their dice one at a time and begin placing them on their stats- this is going to have give them limitations, options, and strategy choices for the last 70% of the game. Then, each round, the first player will draw dice from a bag, roll them and sort the dice on the initiative track lowest to highest. 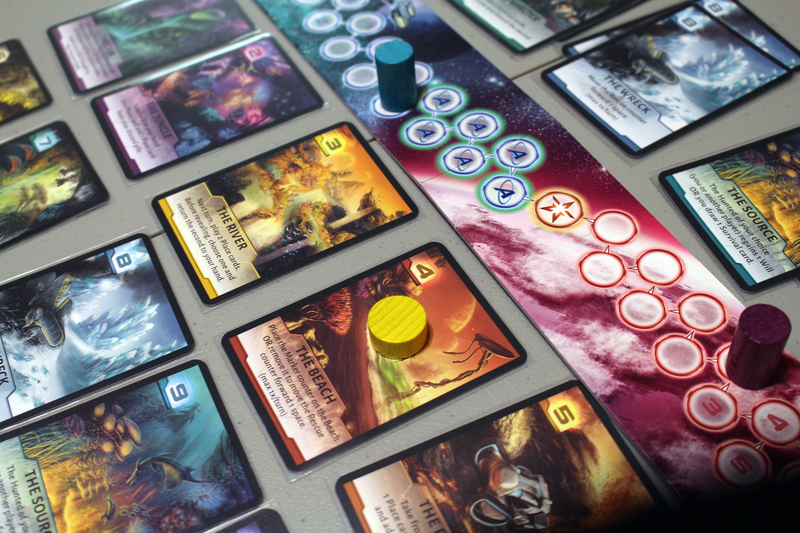 Each player will draft a die, determining turn order when purchasing an item from the market. However, before you purchase an item, each player will take the die they drafted and place them in their stat rows, using the abilities for that particular stat (these stat abilities are ignored during the initial die placement phase). The stat ability actions allow players to modify and move their dice as you might expect. Players choose equipment in turn order. While some equipment grants extra scoring opportunities and some give you abilities, all are beneficial in their own way. Many items have an alignment modifier that happens when you purchase it, while skills affect your alignment when used. Your character’s alignment of good versus evil and lawful versus chaotic also affects end-game scoring. Each alignment card is different and forces the player to consider this when purchasing items and skills. 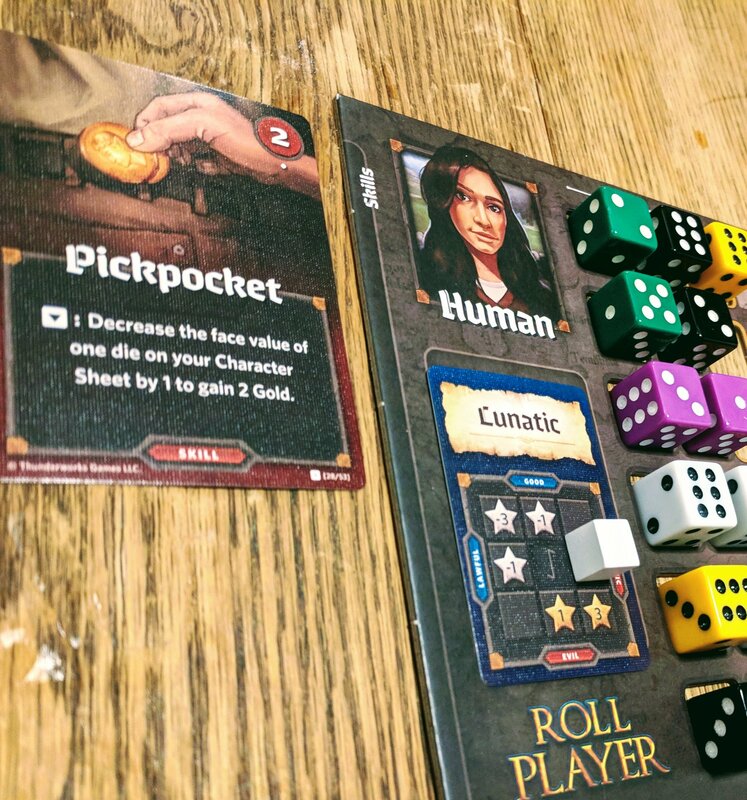 While Roll Player feels much more like a puzzle than I expected when I first heard about it, I thoroughly enjoyed playing it and would be happy to do so again. 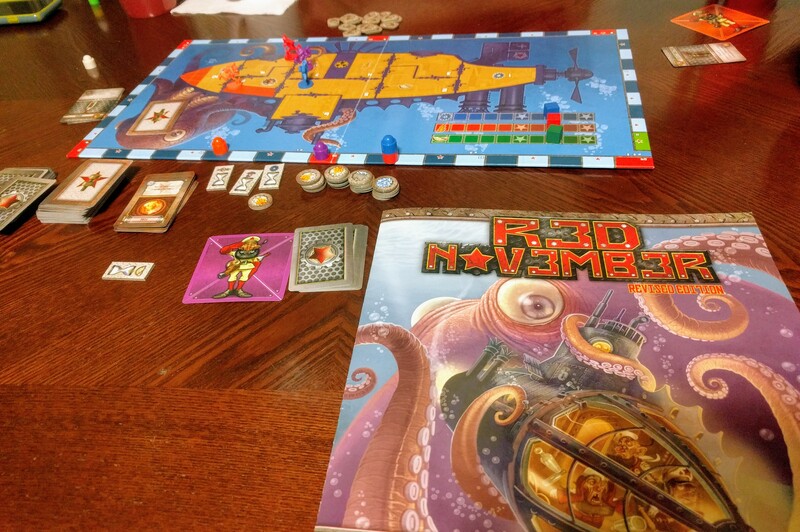 I typically do not enjoy very mentally taxing puzzle style games, and while Roll Player is fairly middle weight, it does give the players some strategic options. Do you focus on putting your character, collecting traits, or getting your alignment in the right place? My gut tells me it is fairly difficult to work all of these aspects perfectly, but it sure is fun to try. In the end, you can say something like, “I created a lawful evil Halfling with a full suit of light armor.” Thinking about the thematic implications of Roll Player is very fun and at the same time it’s a game where efficiency is key, and that’s not a bad thing in my book. 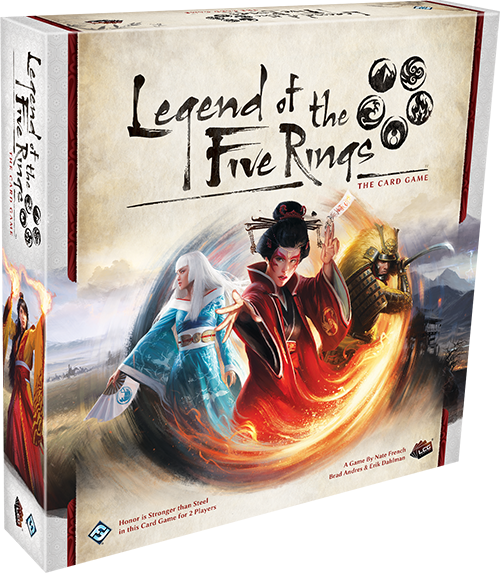 I look forward to playing a Roll Player again in the near future, and would recommend it for almost any type of gamer. I’m conservatively giving it a 7 out of 10. If you like puzzle style games I’m giving it a +1, and another +1 if you enjoy RPG’s or character building. Give Roll Player a try for a refreshing break between tabletop RPG sessions!